My Amazeing Journey: My Bedroom is finished! 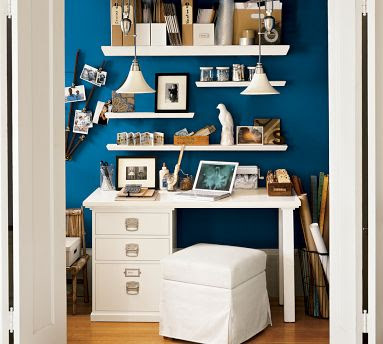 Purchase the organizational shelving/ledges from pottery barn to create a haven of sorts for the organizational maniac in me! 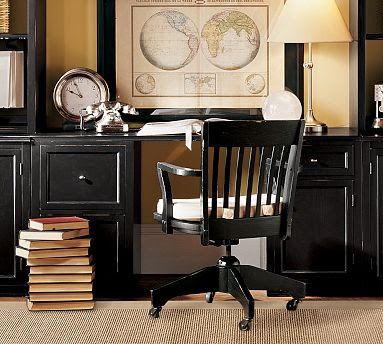 Then, I wanted to buy this Logan Desk at Pottery Barn because it had storage and I just liked it. Then I totalled the cost and remembered I'm trying to pay off debt, not get into more debt! So I decided what I had would work if it was just cleaned out and organized appropriately. It's amazing what a little cleaning and throwing out will do to a space! The rest of the story. Nothing new here, just clean!! More angles for you to see. This was the big project...Installing a ceiling fan! I had a ceiling fan there, but the light hasn't worked for about 6 months. So I've been living in darkness. The old fan was probably about 20 years old and so I thought a new one was in order. I thought this was pretty and feminine. I purchased it at Lowes and had their Home Installation guy come and install it. (If you are married to a home improvement man, be thankful! Half our (mom and me) money always goes to having people install things we can't!) Anyway, after he got in and took out the old fan he came to get me and said, "mam, I need to show you something"...NEVER a good sign! Having things installed or improved at our house is never easy because the house (and everything in it) is 30+ years old. Things aren't as easy to install here as it would be in new construction. Plus, my dad and grandpa build the house and so they may not have done it the standard way. The Lowes guy said, "whoever installed this wanted it to stay up forever". I thought yes, that would be my dad. He did things well, but wanted it to last a lifetime. He never thought styles would change! Anyway, to make a long story short he was creative in his installation process and got it up. It took about 4 times as long as a normal install and of course that meant more money out of my pocket for a 'simple procedure'! But now, I have light and air! I completely cleared off my bookshelves and gave two boxes of books to goodwill. You just can't keep everything! So now my curtains, windows, blinds, furniture, bedding, and everything else in my bedroom (and the bathroom) are completely clean and organized. Now, I'm off to the nursery. That will be fun! Your room looks great. Cleaning out and being organized is such a good feeling. I can't wait to see pictures of the nursery!! You did a great job! Doesn't it feel nice to have a place for everything? Like Jill, I also cannot wait to see the nursery. I cannot wait to decorate one of those some day!